Welcome to 20 Years On, a series here on VivaLaVidaFM where we take one of the games hottest prospects and see where they end up at the end of their career in Football Manager. In this post, we see where Brazilian youngster Rodrygo could end up in 20 years time. Rodrygo is a right-footed winger who plays for Santos in Brazil. The 16-year-old has excellent potential to go on and become a top player in world football. He made his Serie A debut in November 2017, aged 16, before becoming Santos’ youngest ever player to appear in the Copa Libertadores. Two weeks later he became the youngest Brazilian to score in the Copa Lib. Rodrygo begins his FM18 career in Brazil with giants Santos. He was unable to help his side to any silverware in his time there and moved to Europe in 2019. Sevilla signed Rodrygo from Santos for £12.25M. In his five seasons in Spain, Sevilla’s best finish with Rodrygo was fourth which qualified them for the Champions League the following season. They reached the 1st knockout round where they lost out to Liverpool. Rodrygo left Spain to sign for German champions Bayern Munich in 2024. He was bought for £61M and joined Bayern in an effort to make a bigger impact in European football. This he did, helping Bayern to a CL final where they lost to German rivals Dortmund though Rodrygo will be disappointed not to have won any continental silverware. PSG signed a 30-year-old Rodrygo for £70M in 2031. In his time in France, the Brazilian made over 100 appearances but again fell short in Europe – they lost the 2033 CL final to Bayern Munich! Rodrygo’s final club was Atletico Madrid who he joined on a free transfer in 2034. He made 22 appearances in his first season but was only used once in his second year. He retired at the end of his two-year contract. Rodrygo struggled to cement a first-team spot in Brazil’s first team over the course of his career due to the sheer quality of depth in his position internationally. He did earn 30 caps for his country and won two international honours. Brazil lifted the 2026 World Cup – Rodrygo started in the final against Portugal and ended as the match’s second-best performer! If you have any players you would like to see in this series, do feel free to suggest them in the comments! Thanks for reading and I hope you enjoy the series. Be sure to follow me on Twitter as I will be posting many save updates there! 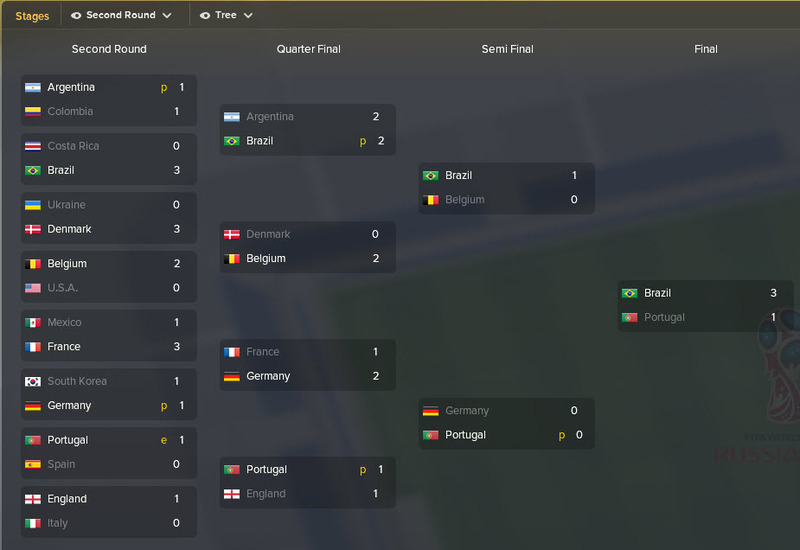 This entry was posted in FM Wonderkids | 20 Years On, FM18 Guides, Experiments & Wonderkids, Football Manager 2018 and tagged brazil, fm wonderkids, fm18, football manager, rodrygo, santos. Bookmark the permalink.